You’re never too young to begin reading and it’s always fun to find a delightful story that you can follow. Today author Beverly Stowe McClure stops by as part of her PRINCESS BREEZE Blog Tour through MC Book Tours. As part of the celebration you can enter the tour-wide giveaway (courtesy of the author) for one of two paperback copies of the book (U.S. only) being given away. Please see the end of the post for more details. For months, Breeze Brannigan has heard nothing from Cam, the prince she met at school and who disappeared one night, without telling her goodbye. On the night, she graduates from middle school, however, he contacts her and invites her to visit Isla del Fuego, his home. Who could refuse such an invitation? Breeze along with her whole family and best friends, Amy and Allison, soon sail to the island, where she and Cam renew their friendship. But danger lurks; a legend comes to life; and Breeze finds herself in the middle of a battle that can have one winner. 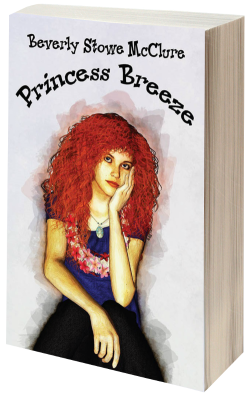 PRINCESS BREEZE is available at Amazon, Barnes and Noble, and 4RV Publishing. The first book in the series is JUST BREEZE. Eighth grade starts out the same as every other year for Breeze Brannigan. She’s still the tallest student, boy or girl, in her class, wears shoes that would fit an elephant, and her smile reveals dazzling braces that blind everyone within ten feet. Then she meets Cam, the new boy in school who speaks with an accent and must be from another planet, for none of the earthling boys she knows are so polite. He also has a secret, a secret that could mean life or death for Cam and his mother and that Breeze must help him keep. JUST BREEZE is available on Amazon. See our review of Just Breeze here. Thanks for stopping by today during Beverly’s visit. Do you enjoy finding books to share with youngsters in your life? This is a tour-wide giveaway (courtesy of the author) for one of two paperback copies of the book (U.S. only). The giveaway ends at 12 a.m. (EST) on Tuesday, July 25. To enter, just click on the Rafflecopter widget below (if it shows up) and follow the instructions. If the widget doesn’t appear, just click HERE and it will take you to the Rafflecopter page where you can enter. Be sure to make a comment here before clicking on the link above.